When I take a screenshot, I want it to prompts me for text and/or auto adds text, and places it above/below/wherever on the image I want it. I suppose this could be created by exposing the edit functions to a scripting language, should you allow me to add/edit scripts to a profile and execute them upon taking a screenshot. 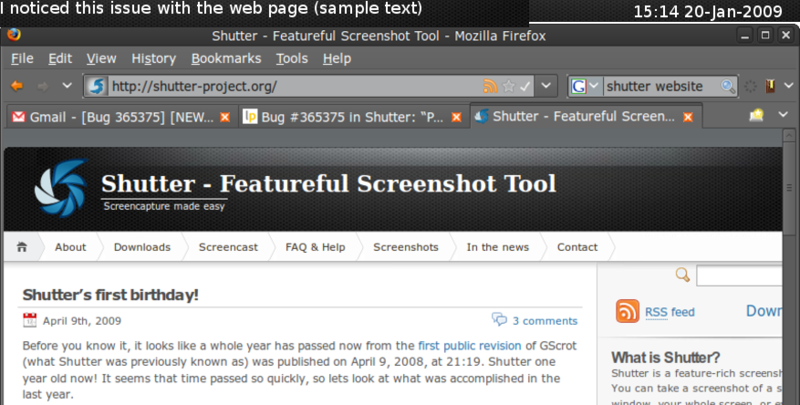 So you'd like to be able to have 'notes' on a particular screenshot, ala on files you can have in nautilus? Thank you for all the reports by the way, the use cases are quite helpful. I attached a sample image of what I was originally thinking. Text manually/automatically added to the top of the picture. This makes is visible to others when I paste that into a test plan (an open office writer doc) or attach it into a bug tracker (like here).